James G. Boswell II, who inherited a huge expanse of farmland in the San Joaquin Valley of California, then quadrupled its acreage to create a cotton-growing empire, died last Friday at his home in Indian Wells, Calif. He was 86. James G. Boswell II on some of his property in California. He died of natural causes, according to a statement from his family. It was the boll weevil’s decimation of the cotton fields of Georgia that sent Mr. Boswell’s uncle James Griffin Boswell, for whom he was named, across the country in 1921. Outside Corcoran, a rural town in Central California, Colonel Boswell (as the uncle preferred to be called) bought the first of what gradually became 50,000 acres. In 1952 he bequeathed his cotton fields to his nephew. 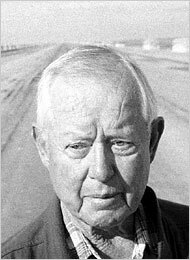 James Boswell II eventually expanded the family’s holdings to approximately 200,000 acres, including 60,000 in the Australian outback but not including the 20,000 acres in Arizona that he sold in the late 1950s to the Del Webb Development Company. Those 20,000 acres were transformed, with Mr. Boswell as a development partner, into Sun City, one of the nation’s first retirement communities. “It speaks to his incredible business sense that when his Arizona land was no longer good for growing cotton he was savvy enough to grow houses,” Rick Wartzman, the director of the Drucker Institute at Claremont Graduate University in Claremont, Calif., said Tuesday in an interview. Mr. Wartzman, a former business editor at The Los Angeles Times, is the author, with Mark Arax, of “The King of California: J. G. Boswell and the Making of a Secret American Empire” (PublicAffairs, 2003). The J. G. Boswell Company currently owns about 150,000 acres in California and, according to Hoover’s Inc., a business analysis company, is the largest producer of cotton in the United States. It supplies textile mills worldwide and has annual sales of more than $150 million. The company’s expansion has not been without controversy. Its vast, well-tended lands and network of irrigation canals stretch across the bed of Tulare Lake, which was once the largest freshwater lake west of the Mississippi, four times the size of Lake Tahoe. Early pioneers encroached on the lake to irrigate their farms, a process that Mr. Boswell’s uncle accelerated as he bought more property. Four rivers feed Tulare Lake. The Boswells forcefully and successfully lobbied for the construction of dams that largely diminished the lake, draining its bed for more farmland. Mr. Boswell also introduced techniques that became a model for large-scale farming: lasers that ensured level fields for even water distribution; bioengineering of new and pest-resistant seeds; computerized cotton gins with a capacity to produce 400 bales a day — enough to produce 840,000 pairs of boxer shorts, according to a 2003 article in The Los Angeles Times. Born on March 10, 1923, in Greensboro, Ga., Mr. Boswell was the son of William Boswell Sr. and Kate Hall Boswell. When he was a child, the family moved to California to join in his uncle’s enterprise. After serving in the Army in the Pacific during World War II, Mr. Boswell returned to Stanford University in 1946 to complete his bachelor’s degree in economics. There he met Rosalind Murray; they married and had three children. She died in 2000. Mr. Boswell is survived by his second wife, the former Barbara Wallace; his son, James, who now runs the business; two daughters, Jody Hall and Lorraine Wilcox; and five grandchildren. Mr. Boswell was a complicated, reticent man. He saw himself as a cowboy and was proud that he had lost two fingers in a cattle-roping accident. He golfed with Arnold Palmer. He sat on the boards of General Electric, the Security Pacific Bank and the Safeway supermarket chain. He was chairman, president and chief executive of his company from 1952 until he retired in 1984. Mr. Boswell did not like to talk about himself or his business. When Mr. Wartzman and Mr. Arax were doing research for “The King of California,” Mr. Boswell spurned many requests for an interview.